The 'Minor', introduced in 1928, after the takeover of Wolseley Motors, was Morris's answer to the amazingly successful little Austin 7. Its chassis was a little more sophisticated than the Austin's and its Wolseley designed engine actually had to be detuned for Morris use. Cecil Kimber was quick to realise the potential of this engine and later MGs, like the 'F' type Magna, had engines developed from it. 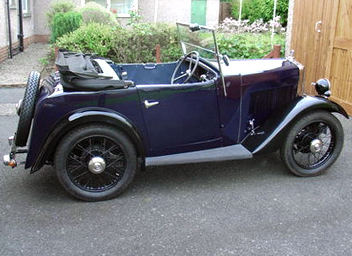 In fact, it could be argued that the MG 'M' type was merely a Minor supplied with a 2-seater boat-tailed body! But equally, it could be said that the original Wolseley Hornets were stretched versions with the 6-cylinder version of the engine later developed by MG for the 'F' type! The reality is that both marques depended on the profitability of the Minor for their existence but were much more than 'badge-engineering'!